BACKGROUND: A Red List of threatened bryophytes is lacking for Africa. The International Union for Conservation of Nature (IUCN) Species Survival Commission (SSC) Bryophyte Specialist Group has recently launched the 'Top 10 Initiative' to identify the 10 species on each continent that are at highest risk of extinction. RESULTS: Fifty bryophyte species, representing 40 genera and 23 families, have been identified as Top 10 candidates. Of these, 29 are endemic to Africa and 21 are restricted to the East African islands. The majority of the candidate species occur in one of eight 'biodiversity hotspots' with most species (19) in the Madagascar and the Indian Ocean Islands hotspot. CONCLUSION: This is the first list of lost or threatened bryophytes for Africa and the first Top 10 list of the IUCN Bryophyte Specialist Group. It represents an important step towards regional and global Red List assessment of bryophytes, thus meeting the targets of the Updated Global Strategy for Plant Conservation 2011-2020 and priorities of The Shenzhen Declaration on Plant Sciences. The bryoflora of sub-Saharan Africa and the East African islands is poorly known and recent taxonomic and floristic activity is minimal in comparison to other regions of the world (Diop et al. 2018; Hallingbäck & Hodgetts 2000; Magill 2010; O'Shea 2005; Wilding 2017). Recent, but still incomplete, floras and identification guides are available only for southern Africa (Magill 1981, 1987; Magill & Van Rooy 1998; Perold 1999), tropical Africa (De Sloover 2003), Kenya (Chuah-Petiot 2003; Wilding et al. 2016), West Africa (Wigginton 2004) and Rwanda (Fischer 2013). However, a series of regional checklists with accepted names, synonyms, literature references and geographical distribution by country, of which the moss checklist of O'Shea (2006) and the liverwort and hornwort checklist of Wigginton (2018) are the most recent, provide a sound basis for research on the taxonomy, ecology and conservation of African bryophytes. The documentation of plant diversity and its urgent conservation are priority objectives of the Updated Global Strategy for Plant Conservation 2011-2020 (Convention on Biological Diversity [CBD] Secretariat 2017) and The Shenzhen Declaration on Plant Sciences (Crane et al. 2017). Several authors drew attention to the in general smaller and less spectacular, but to the same degree rare or threatened, bryophytes, especially in centres of bryophyte diversity, and emphasised the need for Red Lists (Hallingbäck & Tan 2010; Geffert et al. 2013; Longton & Hedderson 2000; Szabó & Pócs 2016). To rigorously assess the estimated 18 000 bryophyte species globally (Frey & Stech 2009), following IUCN methodology, which is now generally accepted and advocated by, for example, Vanderpoorten and Hallingbäck (2009:488), is an unsurmountable task given the current personnel and economic resources devoted to bryophyte conservation. Such an endeavour of IUCN red-listing is currently underway for the ca. 1800 European bryophyte species (IUCN 2017c). To reinitiate red-listing activities on a global scale, the IUCN SSC Bryophyte Specialist Group has launched the so-called 'Top 10 Initiative' (IUCN 2017d; IUCN SSC 2016) to identify a minimum of 10 species at high risk of extinction from each continent and properly assign them to an IUCN Red List category (IUCN 2012a; IUCN Standards and Petition Subcommittee 2017). It is generally accepted that centres of diversity and endemism, or so-called 'biodiversity hotspots', are priority areas for conserving biodiversity (Geffert et al. 2013; Marchese 2015). Conservation International, through the Critical Ecosystem Partnership Fund (CEPF) (2016a), recognises 36 global biodiversity hotspots. A biodiversity hotspot is characterised by high levels of vascular plant endemism (>1500 endemic species) and 30% or less of its original natural vegetation remaining (Conservation International 2017). Many of these are heavily threatened by habitat loss and other human activities (CEPF 2016a; Mittermeier et al. 2004). The hotspot system is used to assess global conservation priorities and to provide grants to non-governmental and private sector organisations through the CEPF (2016b; Conservation International 2017). Eight of the global biodiversity hotspots are found in sub-Saharan Africa and the East African islands (Figure 1): Cape Floristic Region, Coastal Forests of Eastern Africa, Eastern Afromontane, Guinean Forests of West Africa, Horn of Africa, Madagascar and the Indian Ocean Islands, Maputaland-Pondoland-Albany and Succulent Karoo biodiversity hotspots. The area covered in this publication comprises sub-Saharan Africa, together with the Atlantic and Indian Ocean islands in the tropics (Figure 1). This corresponds to the area covered by the checklists of O'Shea (2006) and Wigginton (2018), except for the islands of Cape Verde, Ascension and St. Helena, which are excluded here. Experts on the taxonomy, ecology and conservation of African bryophytes were invited to contribute to two initiatives, namely the 'Top 10 Initiative' by the IUCN SSC Bryophyte Specialist Group (IUCN SSC 2016) and the 'Search for Lost Species' initiative (Global Wildlife Conservation 2014). Global Wildlife Conservation approached IUCN Specialist Groups in 2014 to suggest candidate species for a proposal to search in the field for species that have gone unrecorded for years or decades (funding pendent). The list of 50 species includes all threatened African bryophytes listed in the global IUCN Red List of Threatened Species (IUCN 2017e; Tan et al. 2000), and the threatened African endemics identified as 'Critically Endangered' in the Red List of liverworts and hornworts for Réunion (Ah-Peng et al. 2012). In the Online Appendix 1, each species is presented at the hand of its taxonomy, geographical distribution, habitat (including substrate) and most likely threats. The current Red List status is indicated for those species that were previously assessed, either at the global or at regional scales. However, not all of these Red List assignments follow IUCN methodology consequently, and some of the global Red List statuses are in need of revision. Family placement of the genera follows the classifications of Goffinet, Buck and Shaw (2009) and Frey and Stech (2009) for the mosses and Söderström et al. (2016) for the liverworts. Species author citations follow Söderström et al. (2016) for the liverworts and Missouri Botanical Gardens' TROPICOS database (Tropicos.org) for the mosses. The 10 species that are at highest risk of extinction, and most likely to be categorised as 'critically endangered' when (re-)assessed using the latest IUCN Red List criteria (IUCN 2012a), were selected for the Top 10 list for Africa (Table 1). Monotypic genera and subgenera received priority and preference was given to species recognised and accepted in the latest world and African checklists of bryophytes (O'Shea 2006; Söderström et al. 2016; Tropicos.org) for which precise information on localities is available. Altogether, the species' known localities are found in 16 African countries (Online Appendix 1). Eighteen species occur in the Flora of Southern Africa area (Magill 1981), with 15 species being endemic to South Africa. Of these, seven species are restricted to the Fynbos Biome (Rebelo et al. 2006) of the southwestern Cape. The Indian Ocean islands of Réunion and Madagascar are well represented on the list with 12 (six endemic) and 11 (four endemic) species, respectively. Six of the eight global biodiversity hotspots recognised in sub-Saharan Africa and the East African islands, based on vascular plant species and vegetation, contain candidates for the Top 10 list (Figure 1). 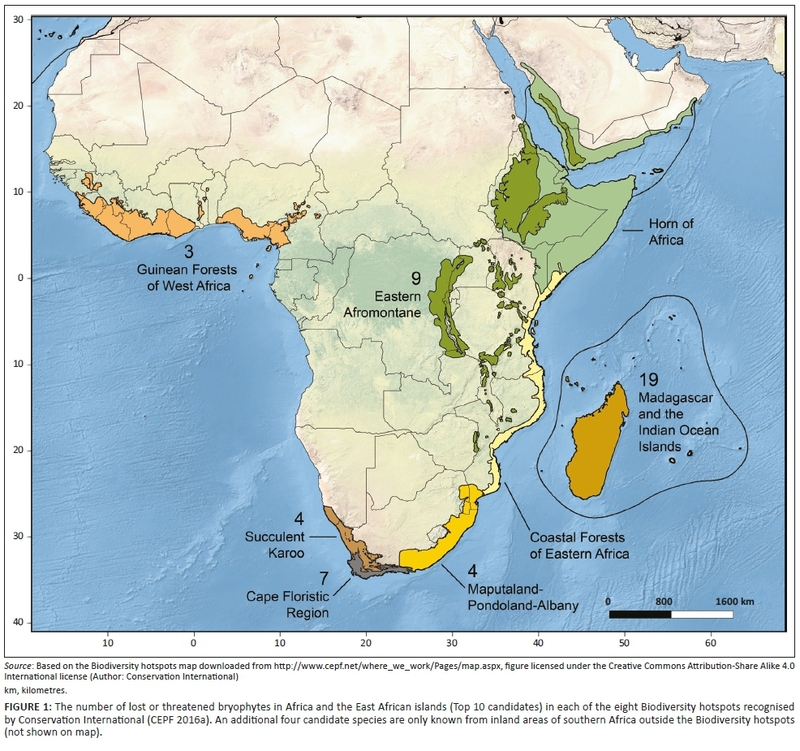 The three hotspots with the most species are (1) Madagascar and the Indian Ocean Islands with 19 species, (2) Eastern Afromontane with nine species and (3) Cape Floristic Region with seven species. The remaining hotspots with threatened bryophytes are: Maputaland-Pondoland-Albany (four species), Succulent Karoo (four species) and Guinean Forests of West Africa (three species). Only four species, all from inland areas of southern Africa, have not been reported from any of the global biodiversity hotspots. They are Anacamptodon marginata (Dixon) W.R.Buck from Mashonaland West Province of Zimbabwe, Cryptomitrium oreades Perold from the Highlands of Lesotho, Fissidens capriviensis Magill from the Caprivi Strip of Namibia and Gymnostomum lingulatum Rehmann ex Sim from the Woodbush-Haenertsburg area in the Limpopo Province of South Africa. The biodiversity hotspot with the highest number of lost or threatened species, as well as Top 10 species which are at highest risk of extinction in Africa, is Madagascar and the Indian Ocean Islands (Table 1, Figure 1). This hotspot is dominated by Madagascar, the fourth largest island globally, and includes the Seychelles (including Aldabra), the Comoros, Mauritius (including Rodrigues) and the French overseas departments of Réunion, Mayotte (one of the Comoros) and the volcanic Iles Esparses around Madagascar (Figure 1). The island of Madagascar, especially the eastern lowland rainforests, is known as a global centre of bryophyte diversity and endemism and the most species-rich area of bryophytes in Africa (Geffert et al. 2013; Tan & Pócs 2000; Vanderpoorten & Hallingbäck 2009). It has also been identified as one of two major Lost Spots in Africa, countries where 'lost species', including a few mosses, are concentrated (Global Wildlife Conservation 2014). Agricultural activities, urbanisation, invasive alien species and deforestation have devastated and fragmented habitats, especially in the lowlands, throughout this hotspot (CEPF 2016a). At least one of the endemic bryophyte species from the Seychelles island of Mahé, Xylolejeunea muricella Xiao L.He et Grolle, may already be extinct (Online Appendix 1). There is also concern about the recent marked increase in illegal logging in the remaining forests of Madagascar (Green & Sussman 1990; IUCN 2017a). This is the first compilation of bryophytes for sub-Saharan Africa and the East African islands that are most probably lost or threatened. Although it is not exhaustive, and many of the 'threat categories' reported herein are in need of revision and require to be scrutinised against the IUCN Red List criteria (IUCN 2012a), it represents a first approximation of the threats to bryophytes in Africa. The species on the list of lost or threatened bryophytes served as candidates for the selection of the Top 10 species in Africa at high risk of extinction. Therefore, it is a crucial contribution towards the Top 10 Initiative of the IUCN Bryophyte Specialist Group (IUCN SSC 2015) and thus to the (global) IUCN Red List of Threatened Species (IUCN 2017e), as well as towards an assessment of the extinction risk of bryophytes on the African continent. Hence, it is a significant step towards meeting the targets of the Updated Global Strategy for Plant Conservation 2011-2020 (CBD Secretariat 2017) and priorities of The Shenzhen Declaration on Plant Sciences (Crane et al. 2017). J.v.R. compiled the species accounts, analysed and interpreted the data and drafted the article. I.B. and A.B. conceptualised and initiated the project 'Top 10 Initiative' and commented on manuscript versions. All the authors contributed to the final version of the article.